Drooping-Flowered Ladies' Traces. Stiranthes Cernua, Richard. Natural Order, Orchidaceae. 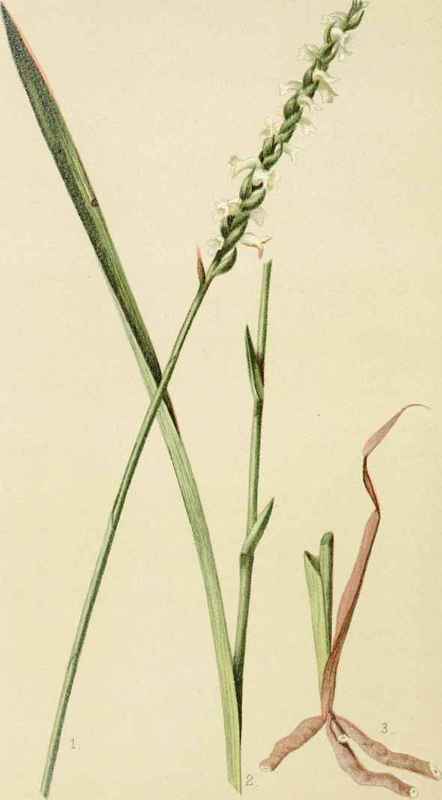 THE plants now called Spiranthes were placed in the genus Ophrys by Linnaeus, and in that of Neottia by his contemporary Willdenow, and under the names of these genera they must be looked for by the historical investigator. Our own botanist Nuttall, in his earlier works, classes them with Neottia, but in his later writings (1827), he calls them "Spiranthes, a section of the genus Neottia" The genera Ophrys and Neottia still exist, and have given their names to two of the various tribes into which the order Orehidacea- is divided; but Spiranthes has now been universally adopted as the generic name of the plants to which our species belongs, even by English authors, with whom the old Neottia spiralis is at present Spiranthes autumnalis. This last-named plant is probably the only representative of the genus in England, nearly all of the fifty species or so which compose it being natives of the New World, although only a very few of them are found within the limits of the United States. Among our American genera there arc two, besides Spirau-thes, which belong to the tribe Neotteae, namely, Goodyera and Listera, Spiranthes being intermediate between them. All the species of the genus Spiranthcs have a callous protuberance at the base on each side of the lip, while those of the other two genera have none; Listera has all the sepals and petals spreading, and thus differs from its fellows, the petals of the latter being so arranged as to be ringent (or gaping) at the base. Many other peculiarities of more or less importance might be pointed out as characteristic of the different genera, but it is hardly necessary to do this, as there is seldom any difficulty in determining the genus of these plants from their general appearance. The species, on the contrary, are very difficult of determination, as there are many varieties of each, which, by their great apparent differences, are calculated to puzzle the student. Of S. cernua, for instance, according to Dr. Gray, the commoner form has pure white, sweet-scented flowers, grows in wet places, and often loses nearly all its root-leaves at flowering-time, while one variety grows in dry ground, has greenish, cream-colored, stronger-scented flowers, and retains its root-leaves. The old name Ncottia is Greek for bird's nest, and was given to our plants, says an old writer, "because the plaiting of the roots one among another resembled a crow's nest." Spiran-thes is also from the Greek, spcira meaning a spiral or coil, and anthos a flower, and seems to have been suggested by the apparently twisted arrangement of the flowers, which strikes every observer. The old English name was "Ladies' Traces," from the resemblance of the twisted spikes to the silken cords or laces, formerly called "traces," with which fair dames used to gird themselves and fasten their various articles of dress before hooks and eyes, buttons, pins, and the like were invented. The word has become almost obsolete in this connection now, being applied only to the cords or ropes by which horses are attached to the plough, or to the leather straps of more pretentious harness. The original meaning of the word having thus been forgotten, modern authors spell the name of our plant "tresses," and suppose it to have been adopted from the resemblance to a tress or curl of hair; and perhaps the two words may originally have been derived from one root, for certainly many flowing tresses have proved to be the traces by which masculine hearts were chained to the triumphal car of beauty. The specific name, cernua, is from the Latin, and alludes to the habit which the flowers have of turning their faces downward. Spircnthes cernua might, therefore, be called in English "Drooping-flowered Ladies' Traces." We have already noted that there are many varieties of the different species of Ladies' Traces; and in view of this fact, it will be best for the student to consider all the characteristics very carefully in trying to determine a species, and then to strike an average from the whole. There arc several points, however, which will materially assist the young botanist. The first of these is the division of the genus into two sections. According to Dr. Gray, the species in one of these sections have the flowers in three ranks, crowded in a close spike, while those in the second have the flowers in one straight or spirally twisted rank. In the latter case, we may picture the arrangement of the flowers to ourselves if we imagine them set upon a string, and this string wound in a spiral around a stick; in the first case, there are three such strings running closely parallel to each other, and also twisted round the stick as before indicated. Our present species belongs to this three-ranked division. Dr. Chapman and Prof. Wood have essentially the same arrangement. The roots also offer some good specific characters, being a mass of fleshy fibres in some species, as in Spiranthes cernua (Fig. 3), and quite tuber-like in others. In some cases, again, the rachis, that is to say, that part of the stem to which the flowers are attached, is perfectly straight, and only the flowers seem coiled around it, while in other species it is screw-like, and seems to carry the flowers with it as it coils. The interest which the orchidaceous plants have always inspired has been considerably increased by the publication of Mr. Darwin's writings, and more especially by his work on the "Fertilization of Orchids." In this book, the celebrated evolutionist devotes considerable space to the genus Spiranthcs, and also mentions our species, S. cernua. After a thorough discussion of the matter, he comes to the conclusion that everything in these plants is most beautifully contrived so "that the pollinia should be withdrawn by insects visiting the flowers"; and finally closes his remarks with the following sentence: "Then, as soon as the bee arrives at the summit of the spike, she will withdraw fresh pollinia, will fly to the flowers on another plant, and fertilize them, and thus, as she goes her rounds and adds to her store of honey, she continually fertilizes fresh flowers, and perpetuates the race of our autumnal Spiranthcs, which will yield honey to future generations of bees." It is very singular that a plant with such a suggestive common name should never have attracted the attention of the poets; and yet this seems to be the case, at least as far as our own reading extends. The fact appears still more remarkable when we consider the delicious fragrance of the flower and the peculiar circumstances under which it is found, often growing entirely alone, far away from its orchidaceous relations, and coming into flower long after most of the family have betaken themselves to rest. Our species seems to be confined to the Eastern States, and to be found very seldom, if ever, beyond the Mississippi; but, like some of the other members of the same family, it generally grows in considerable quantities wherever it does occur. 2. Central portion of scape, showing the sudden arrestation of leaves and their transformation into bracts. prev: Canby's Mountain-Lover. Pachystima Canbyi, Gray. Natural Order, Celastraceae. next: Crawling Phlox. Phlox Reftans, Michaux. Natural Order, Polemoniaceae.